Quite simply put: when food can kill you, travel can be terrifying. Thanks to my friend, Linda, a fellow food allergy mom (whose daughter was desensitized to milk through treatment at John’s Hopkins! Yay!) for succinctly articulating this thought. Linda has also traveled extensively with her daughter, and was a good resource for me before we left, and in the decompressing that needed to happen once we were home. The short story: 8 nights in Nicaragua, brought our own food, had one troubling incident, made it home in one piece with no more than a couple of doses of Benadryl. Glad we went. Slight modifications if I were to do it again. 2. We rented places that had full kitchens, so we could prepare hot meals for our son and feel safe. It also meant we could refreeze our ice packs and store our cold items for the week. This worked great, and allowed us to make him his favorite “mac n cheese” (dairy free of course! ), baked chicken and warmed bagels. 3. We brought along a lot of emergency medication. Like 8 epi pens, tons of Benadryl and even filled a script of liquid prednisone (the steroid) after I had read that not all counties readily treat with that. 4. We had all of his allergy information, and key phrases like “he’s having a serious life threatening reaction to milk” translated into Spanish. If something happened, we needed to be able to communicate it! 5. We bought emergency travel insurance. I wanted the peace of mind that if we needed to get out fast for a medical issue, we’d have help. The travel clinic where we got our typhoid shots before the trip told me that the travel insurance carriers were great resources for local medical help, too. So we didn’t just buy the insurance, we printed out all the contact information and coverage instructions so we could be prepared. 7. Most importantly, we were really careful. We planned to be really careful. At home, we eat out and we let our son eat restaurant food, once we’ve done the song and dance about cross contamination and all that. But we decided that we would take no chances while we were traveling, and unless we cooked it, he wasn’t eating it. This really bummed him out, but we stuck to our plan — except for the fruit smoothie we got him at the American-owned hotel Mango Rosa, where we were able to have the food allergy song and dance conversation with the American owner, and we went for it. But then we felt stupid and remembered our plan and didn’t deviate again. But like many well planned events, we failed to foresee every possible issue, and found ourselves in a bit of a pickle (I mean panic) while on an aging ferry on Lake Nicaragua on our way to the most remote place on our trip. No sooner than we lifted anchor and found ourselves leaving land did my son start to show signs of an allergic reaction. We were seated in the passenger area of the cramped ferry — broken seats everywhere, lots of holiday tourists on board, and vendors had been on board selling sunglasses and roasted nuts. Yes, roasted nuts. We hadn’t let my son sit down, for fear of the seats being contaminated, but he got hives on his face and neck and started to complain of an itchy throat. He was scared. We were terrified. This all happened within minutes of leaving the port. I had him outside in fresh air immediately, washing him down with those handy wipes, dosing him with benadryl and counting epis in my head while I imagined having to ask them to turn the ferry around. For all the adrenaline and fear I experienced, the whole thing resolved itself almost as fast as it came on. But from that moment on, I was berating myself for putting us in this position. I mean, what was I thinking taking my FAMILY to this remote place? How could I bring my allergic son to someplace SO FAR AWAY? And even though we had identified before our trip that there was a hospital on Ometepe Island, I was sick about the might-ofs that were running through my head. My darling husband was calm once we were off the ferry (under an hour on the ferry) but I wasn’t calm until we had finished our three night stay on the island and were safely back in the more developed, modern city of Granada. On the return ferry, we never took our son inside, and found a quiet spot on the deck to ride out the trip back to the mainland, and it was a blissfully uneventful trip. The only other point of nervousness for his safety came, ironically, when we visited the active volcano outside of Granada. Now, we weren’t nervous about the VOLCANO erupting (though in hindsight, I seriously brought my family to an active volcano!?!?) But, the air is thin and the sulfur from the volcano can make it hard to breathe. 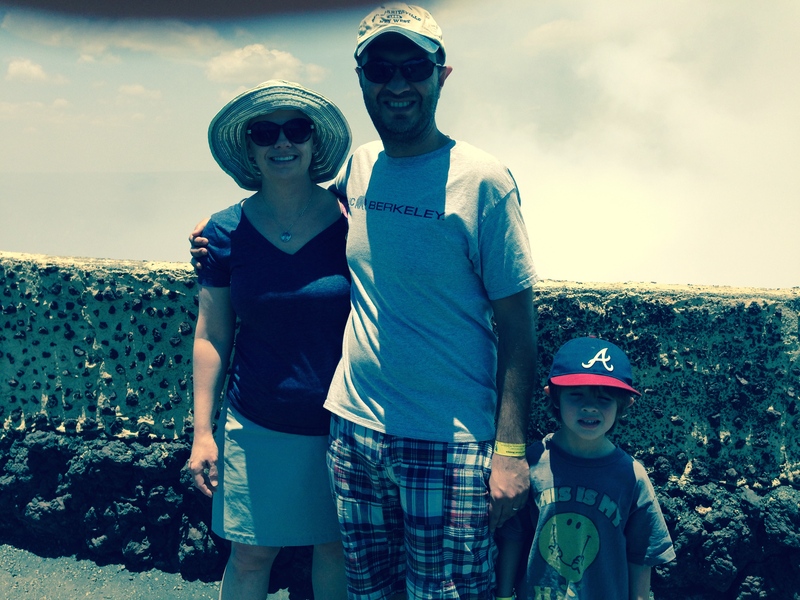 I had trouble as we ascended the volcano (by car), and only then, in that moment, did I realize that I had failed to pack my own inhaler AND MY SON’S inhaler! Oops. Asthma is not a chronic problem for him (it is more an issue for me) but I really had thought that it was in our bag, but it wasn’t. Luckily, there was a great breeze at the top and we all had good clean air to breathe. Problem averted. But next time I would definitely pack the inhalers! Yes. I am glad we went. I would go to Nicaragua again with my food allergic son. I would still do all the planning we did, but I would not go on the ferry. It was too remote. It was too “developing” and I was so unprepared for airborne tree nut particles causing a reaction! I know that the unexpected can happen anywhere, but if it is to happen, I don’t want to be on a remote ferry in the middle of Lake Nicaragua! Ask my son, and he’ll say he loved Nicaragua, but he has asked “next time can we please go to an English speaking country so I can eat in a restaurant?” And that just breaks my heart. Should we have brought food for all 6 of us? Should we have totally avoided eating out (where we’d bring his food that we’d prepared?) It just isn’t practical, especially when part of our purpose of travel was to expose our kids to the food of Nicaragua. But I do wish that he could have been more free to get more smoothies, or to get allergy safe pancakes or other special “restaurant food” that the other boys got. We made sure he got plenty of treats, but they grew less and less special as the trip wore on, and he was sad that he couldn’t eat like everyone else. I would love to hear from other food allergy parents about their experiences traveling abroad! Happy travels. Remote. Rural. Lush. Ometepe Island, formed from two volcanoes, sits in the middle of Lake Nicaragua, one of the world’s largest natural lakes. We debated all week what claim this lake should make, so I had to look it up. According to Wikipedia, its the 19th largest freshwater lake in the world (and the largest in the Americas.) Ometepe was our 2nd stop in Nicaragua. The first was San Juan del Sur; read about that adventure in Part 1 of the “Where’s the Paper” series. The Ferry itself is unimpressive. Worn looking. Old. I did see life vests but didn’t bother assessing how many there were. The timing of our trip was days after the horrific ferry boat sinking in South Korea. For better or worse, we had been cut off from all news and didn’t learn of that tragedy until we returned home. I never felt unsafe on our ferry — except for the allergic reaction that our food allergic son had shortly after we departed. Luckily, the ride was just over an hour and provided stunning views of the volcanoes on Ometepe! 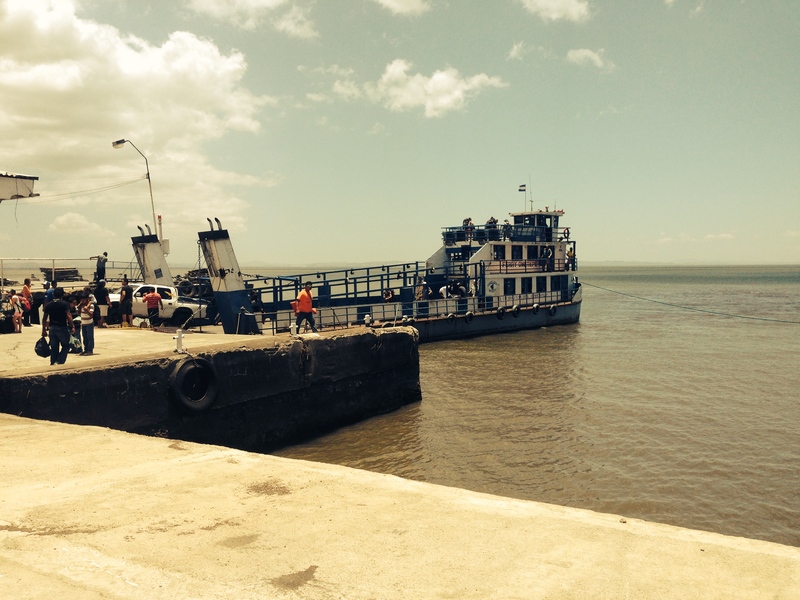 Most ferries to Ometepe arrive in Moyogalpa — the largest town on the island. Getting transportation in Moyogalpa is easy when you arrive by ferry — taxis are lined up and eager for business. We had to wait for the truckload of bananas to move onto the ferry before we could leave, ironically, the only glimpse of that fruit we would have for the 3 1/2 days on the island! Our rental property was an easy 10 minute drive away, and our driver luckily knew how to find it! Nestled in a quiet town called Los Angeles, our farm is called Finca Macedonia. A beautifully lush farm, filled with mango trees, lime trees, avocado trees and more. A flock of roosters wandered around, beautiful birds abound and a few horses rounded out the wildlife we experienced. I found the rental on VRBO, and it was amply large and modern, especially compared to other available lodging. On Ometepe, you can stay in an upscale eco-lodge, or in a hostel. There tourist infrastructure is very limited on the island, and this was the ONLY house we could find to rent. It was important to us to have access to a kitchen to be able to manage our son’s food allergies, and so we were very pleased to find the farm house! The farm keeper and his family live on the property, and saw to our needs during the stay. My boys loved playing with his girls, and while Emerson’s English was limited, it far surpassed our Spanish, and he made sure that we found the path to the lake, and he arranged for fresh fish for us, which his wife prepared in a traditional grill with rice and beans and plantains! We picked many mangoes and limes, and Emerson gave us each a large avocado, which unfortunately didn’t ripen before our trip concluded and we had to forfeit our fruit. In general, our time on Ometepe was sleepy and hot. Our fans in each bedroom did the trick, but as in San Juan del Sur, nights were loud with cicadas, birds, roosters and dogs. The day after we arrived, we ventured onto a local bus, and ended up sitting next to a couple from New Zealand, an American and a Croatian. All of them young, and adventurous — not knowing where they were staying the night, and taking each day as it came. They reminded us of our younger selves, and also made it clear how different travel is when you have three children and an older parent with you! These travelers helped us navigate to our destination, and we exited the bus to find the Charco Verde Eco Reserve. We had a slick brochure from the tourist office that made the Eco Reserve a top destination on Ometepe Island. But we were a tad disappointed. The nature walk was nice — we saw monkeys and some beautiful plants and birds. But we didn’t see anything inside the reserve that we hadn’t seen on our farm or in San Juan del Sur. It being located adjacent to an upscale hotel and restaurant was a fortuitous coincidence for us, as we enjoyed delicious Nica snacks, drinks and their beach. The boys rented a paddle boat, and enjoyed cooling off in the lake. We were so wiped out by the heat and all the walking that we had the hotel call us a private car to go back to the farm. Private transportation in Nicaragua is expensive, but we were too tired to walk the 1/2 mile back to the main road and wait for the bus. Our sense of remote isolation was amplified on Sunday, as we understood that public buses are not running. So we made the day a lazy one and enjoyed the farm and a nice hike/swim with Emerson and his daughter. We made our 3rd trip to the local store — literally inside someone’s home — to replenish our soda supply (which, ah hem, we needed to polish off the rum that was purchased on day 1.) It turns out that the town only gets fresh veggies/fruit delivered on Monday or Tuesday — and we left on Monday morning. We ate simply those few days, chicken, canned veggies, rice and beans… cooking in the house was our plan, and proved harder than we would have expected. It was HOT on Ometepe, and our home had no air conditioning, so cooking made us feel like we were in an oven. Luckily, we had ample space outside to sit and try and catch a breeze. Our ferry ride back to San Jorge was quick and uncrowded. The Easter crowds had dispersed, and things felt less hectic on the return. Our prearranged transportation was waiting for us as we walked off the ferry! I loved how easy it was to arrange transportation with Iskra Travel! We lucked out and Mike, our first driver from the night we arrived, picked us up and took us on the 1 1/2 drive to Granada. My husband and I are city people. There, I said it. 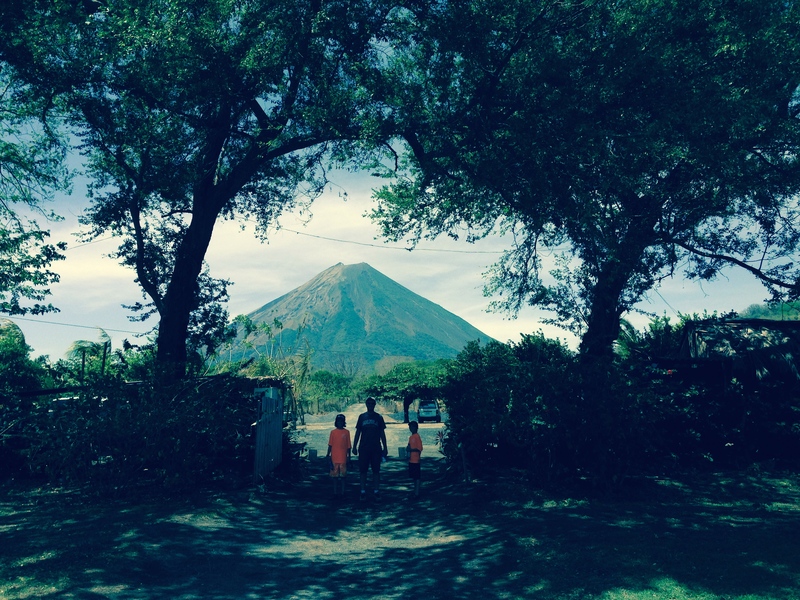 Ometepe Island is great for hikers or adventurous travelers who need little modern comfort. In hindsight, I don’t think we prepared enough for our visit, or knew what to expect. If I were to go again, especially with kids in tow, I would either arrange to have a private car/driver meet us daily or else rent a car. The island is large, and we would have had a better experience had we seen more, but once we were at the farm, the “schlep” to make transportation work was greater than our desire. As a mom of three kids (11, 9 and 5) and one of them having serious food allergies, I was nervous about being so remote “just in case” something were to happen. There are medical facilities in Moyogolpa, the main town where the ferry comes into, but I would have been at a total loss as to how to get there if we had needed it! Pacific coast beauty. Lush tropical growth butting up against dry dessert-like landscape. Hippy surfer beaches with clove-smoking tanned Americans, riding in the backs of pick-up trucks. Mango trees. Banana trees. Monkeys and roosters. San Juan del Sur had a bit of everything for the first of three stops in our 8-day, whirlwind journey around southwest Nicaragua. Me, my husband, our three kids (ages 11, 9 and 5) and my mom; first time to Nicaragua for all of us and it did not disappoint. Crime against tourists in Nicaragua is lower than in some neighboring Latin American countries. We wanted to show the kids a part of the world very unlike what they know. With the help of a close friend, we decided we would visit three places in Nicaragua: San Juan del Sur, Isla de Ometepe, and Granada. We plotted our actual itinerary based on accommodation availability and timing of our flights. For San Juan del Sur, I found Mango Rosa while reading travel reviews on www.tripadvisor.com I don’t think we could have navigated this adventure without the great feedback and advice on Trip Advisor! I’ll add my own review of our hotels there as well. Getting to San Juan del Sur was more of a trek than we had anticipated. Our fault — we only skimmed the details in the guide books, and relied greatly on friends accounting of our itinerary. Arriving in Managua, the capital of Nicaragua, at nearly 8pm local time (2 hours behind EDT) meant the kids were already beyond tired. Our prearranged transport through Iskra Travel was waiting for us outside of customs, and our driver, Mike, whisked us away from the dark airport — at which point we learned that Mango Rosa was nearly 3 hours away! The kids quickly conked out (with husband to soon follow) while I tried my best to see beyond the headlights and take in this new country. Pedestrians walking in the road. At night. Cyclists, in the middle of the lane. This kind of highway travel is not for the feint of heart. Coming up behind a car without taillights on, at full speed, requires an adept and alert driver. Mike did great, but I must admit feeling great relief when we arrived safely at Mango Rosa at 11pm. We quickly settled into our private house, and soon found out that good sleep is hard to get for us city folk! Howler monkeys, roosters (who don’t just cockle-doodle-doo at the crack of dawn) and dogs make for a night time cacophony many decibels louder than I personally appreciate. The trees over our house were filled with monkeys. Time change + sunrise at 5am + very loud roosters who sing out “WHERE’S THE PAPER?” endlessly (+ excited kids) meant we were up EARLY. Mango Rosa offers a lovely menu of breakfast choices, and fresh fruit smoothies, which got our first day in Nicaragua off to a great start. My mother arrived shortly after breakfast (her flight was delayed from the previous night, thanks to an earthquake warning in Managua, something that didn’t deter our Delta flight from arriving, but her Copa Airlines flight through Panama was stuck.) We generally vegged out by the small pool and lulled in our hammocks until late afternoon. We took a ride to one of the small Pacific beaches, Playa Madera, in the open back of a pick-up truck, and spent many hours luxuriating in the warm waters and enjoying local beers while people watching. Most of the beach goers were American or Canadian — with some Nicaraguans in the mix as well. Two bar/restaurants (one with a hostel above) dotted the small beach, known for its killer surfing, and competing loud music blasted from both — sending us out into the sun to escape the noise. We enjoyed watching fabulous surfers and obvious first timers, jumping our own waves and watching a great sunset before returning to Mango Rosa again in the open truck. The kids thought it was fantastically dangerous, exciting and “lawless” to get to ride that way. Another loud night led to a gloriously hot and windy morning where we had to hide the kids from the sun. I forgot to pack the aloe and our SPF 50 didn’t do the trick (or we failed as parents and didn’t reapply often enough.) That afternoon we charted La Pango Rosa (a fishing boat) to take us onto the Pacific for hopefully some dolphin spotting, fishing and swimming. Right out of the beach we saw a whale breach and that was it for water mammals. The waters were choppy and the ride was nerve wracking for a couple of the kids. Once we anchored at another beach and had a cooling swim, the water was calmer and we then enjoyed some drag fishing. My husband reeled in the first of two 8-10 pound fish. We were bummed that it wasn’t something more tasty — but were assured that the local staff would take the fish home to use for soups. The kids were thrilled to catch the fish! I found myself contemplating vegetarianism again. Getting to enjoy another glorious sunset over the Pacific was a nice conclusion to our last night in San Juan del Sur. Mango Rosa was so comfortable, and easy — with an American owner/manager and a fully fluent English speaking staff, I knew that this was a great entree for us into Nicaragua, and I also knew that our next destination wouldn’t be quite the same. We left the next morning after breakfast, bidding our tree full of monkeys and the flock of roosters goodbye. We didn’t actually visit the town of San Juan del Sur. We were in Nicaragua during the popular vacation week around Easter, when Nicaraguans flee to the coast and create what was described by locals as a crazy party scene in the town. The American who ran Mango Rosa likened it to Mardi Gras, Nicaraguan style. I’d have liked to check it out; but my kids had seen on the bar tv an accounting of a death the previous night in the town (and another staff member at Mango Rosa warned that thefts of tourists go way up during the week,) so the kids and my mom (age 71) were deterred and we didn’t push the idea. Helmets on Swing Sets? The evolution of protective gear and keeping kids safe. The other evening, my 9 1/2 year old, highly active, fun loving daredevil of a child took a fall. From our swing set that was only installed 48 hours earlier. It was pretty bad, he was swinging high, and on the front approach he slipped off, flipping forward and taking the blow to the top of his head. Luckily, he says his knees hit the ground at the same time. I heard the thud, though my back was turned and I didn’t register what happened until he was screaming. The fact he jumped up assured me that his spine was ok, but I was worried immediately. We got lucky. Aside from a severe headache for 2 days, and some mild nausea, he did not get seriously hurt. I know because we called the after hours doctor. Twice. I slept with him that night to make sure he was ok, and to keep him on advil through the night. Now I’m nervous. I haven’t let him back on the swings just yet. I know his fall was a fluke; but my fear (all parents have at least one major fear), well my major fear is head injury. Just a week before we were ice skating. I make my kids wear helmets. Yes, they look ridiculous, and no, I never wore one as a kid. But knowing that son #1 is a daredevil speed skater, I take heart in knowing that even professional speed skaters wear helmets. Kid #2 is just the family klutz. And kid #3, it was his first time skating and I expected lots of falls. But how have we as a society evolved to a point where our kids wear helmets when ice skating? I was not the only parent making the mandate. Certainly our society has embraced helmets for biking for a long time, and I’m pretty much a stickler on that front, as well as when scootering or skateboarding. But, isn’t the chance of serious damage GREATER from a fall from high up on a swing compared to other activities where helmets are socially acceptable? How ridiculous is it to want my kids to wear their helmets on the swing set? (Very.) Even though I was scared beyond belief with his fall, I can not allow myself to become that overbearing. And my instinct that this isn’t a good idea is backed up by people who know safety! The CPSC recently wrote a blog post saying that helmets do not belong on the playground, as they pose risks like choking. So, how much protection is too much? I’ve seen parents yell “no running!” while their kid is at the playground (seriously) and there are parents who hold their kids across the monkey bars long after the skill has been mastered. Finding our own rules, knowing how much to protect our kids, I think that is every mom’s gut check. I’d like to think that I have not held my kids back from their own exuberance, but have just required protective gear so I can breathe easier while they be the boys they want to be. But that doesn’t mean that my heart won’t be in my throat while the kids soar high, and it doesn’t mean that I won’t say “be careful” as they head out to swing set from now on. The other night as I cuddled with my 7 year old, out of the blue he announced “if I had a superpower, it would be teleportation.” Yes, my 7 year old said “teleportation.” He went on to explain how useful that power would be playing a game of tag, and then we discussed how handy it would be getting to a faraway destination. The more we talked, the more excited he got. He wasn’t just talking, he was truly imagining what it would be like, what it would feel like to have a superpower! So I got to thinking, what would my superpower be, if I could choose one? It took mere moments before I knew what I needed — in a purely selfish manner — I need more energy. I want a superpower of endless energy. E-N-D-L-E-S-S ENERGY! Imagine, the ability to get the tedious chores of life done and still have capacity to be cheerful while playing with my active kids and then still have enough left over to work and even more there to be an attentive friend and wife…. Doesn’t it sound dreamy? And yet, isn’t it kind of sad that my gut instinct wasn’t something wistful like being able to fly, or something fun like teleportation? Why not something giving like the power to cure illness or prevent tragedy. Being a mom is so demanding that it requires not normal energy that non-moms require, but superpower energy. Energy that allows us to be and do everything our little people require, energy to be a productive member of our community, energy to be a good partner and friend, and energy to take care of ourselves. The problem is, we don’t have superpower energy. We have normal energy. Or low energy. Or, no energy. And yet somehow, we get through the day, wake up and get through the next, and the next…. so maybe we moms do have superpowers. Maybe being a mom is a superpower. I have a superpower. I am a mom. I doubt my son will be impressed that while he only wishes for a superpower that I have one, but at least I am impressed. Today was an emotional day for my nearly 4 year old. He didn’t get shoes, while his two big brothers did. I know, how traumatic for him. Is it child abuse [insert significant sarcasm] to drag a child into a shoe store to watch his big brothers get brand spankin’ new summer shoes, while he wears the chalk stained pair that were acquired last summer? Dinner was comprised of a stew that was too spicy for my kids (in hindsight, I should have not added as many peppers,) fruit and bread. The stew contained black beans, something this child has been allergic to. However, his allergist has advised us to push beans into his diet. This child, who typically eats almost nothing for dinner, says, “mom, if I eat all my dinner will my feet really grow?” And then he got weepy again. I didn’t push it, since we don’t push eating at all in our house. Typically I would have only expected him to eat his bread and fruit; he isn’t very adventurous with food and the stew was not something he would normally try. But he wanted to eat it because he really wanted his feet to grow. I think he ate at least a bite because he said it was really spicy. And then I noticed that his ears turned bright red. They are like our food allergy early alert system. I asked him if he ate one of the beans. He had said they “looked like jelly beans” earlier in the meal. He didn’t know if he had. And then after dinner he threw up. I think he ate a bean. We won’t be pushing them anymore. My poor boy will just have to live with his year-old sandals that are perfectly fine and fit great. And the lady at the shoe store needs to keep her advice about eating dinner to herself.